Hydrotherapy For Dogs: Does it Work & What Are The Benefits? Trendy health fads seem to come and go on an almost weekly basis. We always seem to be hearing about the latest, greatest health, fitness or diet regimes that ‘the stars all swear by. The trouble with health fads is they have a tendency to cloud popular opinion of some relatively new or lesser known treatments that actually work. Hydrotherapy works. It is not a fad and many dogs have reason to be grateful for its existence. So now that's out of the way - the fact that hydrotherapy is a real treatment that produces real benefits - let's take a closer look at what it is and what it does. Simply put, hydrotherapy is the use of water for the treatment of illness or injury. In the case of canine hydrotherapy it allows a dog to take part in controlled swimming exercise which can be particularly beneficial to joints, muscles and limbs as they recover from injury. It offers a therapeutic, relaxed and enjoyable workout, which many dogs are deprived of in day to day life. Arthritic joints or limbs recovering from injury or surgery benefit particularly. Controlled swimming allows muscles to be stimulated and exercised without the stress element associated with land based exercise, causing potential pain. Vets recommend a course of hydrotherapy for pre- and post-surgical conditioning, to reduce weight in obese animals, for painless exercise for pets with arthritis or dysplasia, cardiovascular workout for seniors, rehabilitation for stroke sufferers, and pain management. It is used in many orthopaedic conditions both pre-operatively to improve muscle tone to affected limbs (for instance, prior to total hip replacement) and post-operatively to improve repair - for instance in post-operative care of cruciate ligament rupture, osteochondrosis or fracture repair where light swimming can begin as soon as the sutures have been removed. Preliminary observations suggest that hydrotherapy, if initiated early in the course of disease, can help to maintain muscle tone in cases of degenerative radiculomyelopathy (CDRM) and other neurological diseases with similar presenting signs. In show dogs and racing dogs, it provides an effective means of maintaining fitness and toning muscle, particularly in the winter months, and is a valuable aid to weight control in the obese pet. Hydrotherapy techniques help to relieve pain and strengthen and re-train muscles; because the animal is effectively weightless when swimming. Hydrotherapy acts by encouraging a full range of joint motion, thus improving muscle tone without imposing undue stress on damaged tissues. This is why results can occur so quickly. Each hydrotherapy session should be tailored to an individual dog's condition and fitness level – all dogs should therefore visit through a referral from a veterinary surgeon. An assessment of the dog's condition will be made and the treatment given at each session recorded. In this way the progress that the dog makes can be monitored. The rate at which such progress is made will be dependent on the breed of dog, condition for which it being treated, age and fitness level. There is no set size for a hydrotherapy pool. All pools should have water heated to a temperature in the range 24 to 300C and should allow all year round operation. It goes without saying that the combination of water and electrical circuitry makes it essential that the owners and operators of hydrotherapy pools adhere to strict safety standards. There are appropriate safety certificates for owners of hydrotherapy pools. Cleanliness of the water is a critical factor. All regulated pools must regularly test their water quality and in busy periods this would be several times each day. This is to ensure no harmful bacteria are present and there is no risk of cross infection. In the case of hydrotherapy pools operated under the guidance of The Canine Hydrotherapy Association, their members are required to keep detailed records of water quality. Because hydrotherapists do not have any compulsory regulation to adhere to, as is the case with dog trainers or behaviour professionals, it does not always mean that a non-accredited practitioner is necessarily a bad one. Use your discretion as a customer and speak to as many people as possible, especially your vet, when searching for a suitable hydrotherapy practice. Rates for a hydrotherapy session are set by individual therapist and will vary according to the facility and its location. Typically a session will allow for up to 30 minutes, to include time for drying the dog afterwards. Fees are normally in the range of £15 - £35 per session. In most centres, owners are encouraged to attend sessions to help reassure their dog during its initial exposure to water. 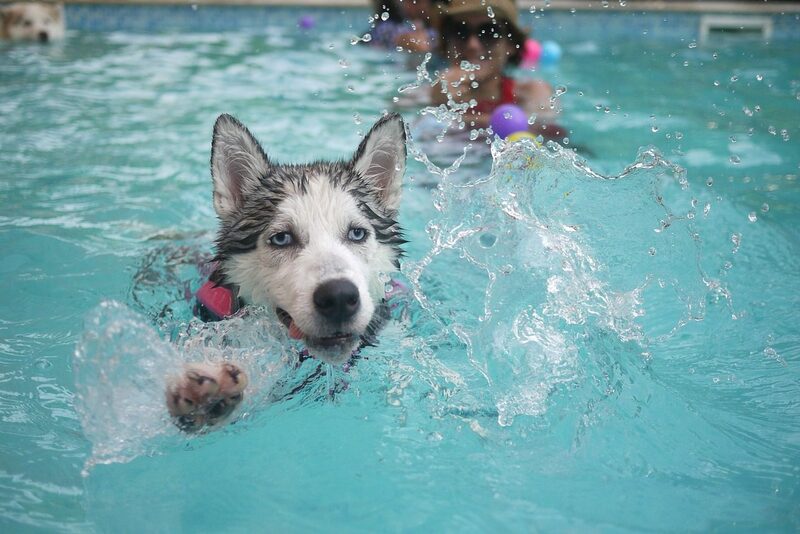 Interested in Hydrotherapy For Your Dog? If you think your dog could benefit from a hydrotherapy session, speak to your vet and see if they can recommend a hydrotherapy practitioner in your area. You might also like to contact some hydrotherapy pool operators and ask if they would be prepared to let you inspect their facilities or maybe talk to some of their existing clients about their experiences. In much the same way that it is important to dog owners to inspect a new boarding kennel and get a general feeling of confidence about the people running the operation, always be prepared to visit premises and ask lots of questions.